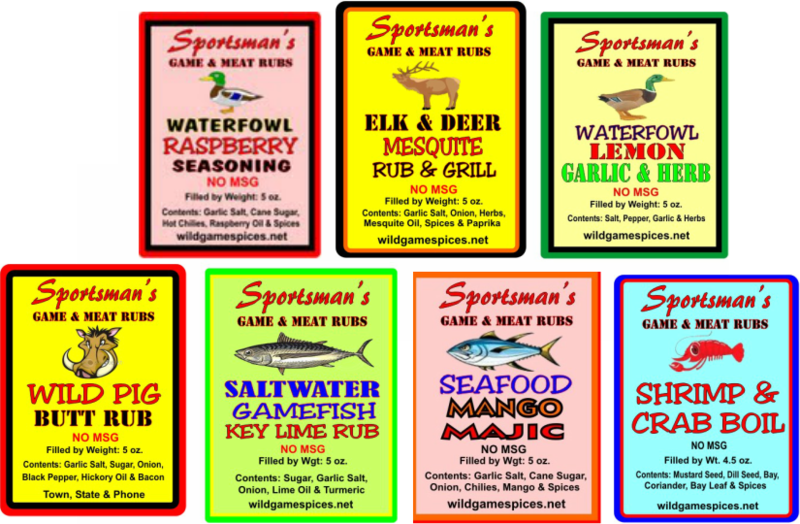 Sportsman's Spices Game Rubs were developed over years of testing to come up with some of the finest rubs and spices for wild game and seafood. After many years of hunting and fishing and hours of grilling, we have developed great rubs and spices for all your game and seafood. From elk, deer, pig, pheasant, quail, and waterfowl to all types of seafood, you will find that these rubs and spices will make your game delicious table fare. Enjoy! that you can mix and match with the assorted spices or order 48 bottles of your favorite. To order any of these great spices, please select from the categories listed. WHOLESALE FOODS-SEAFOOD SEASONING-WILD GAME SEASONING-SEAFOOD SPICE-WILD HOG HUNTING-MEAT RUBS-ELK HUNTING IN COLORADO-WILD BOAR HUNTING-GAME SPICES-PRIVATE LABEL SPICES-WHOLESALE SPICES-WHOLESALE SHRIMP-SEAFOOD WHOLESALE-FOOD SUPPLIERS-SHOT SHOW-GROCERY WHOLESALERS-WILDGAME SPICES. WILDGAME RUBS-SEAFOOD SEASONING WHOLESALE-WHOLESALE FISH-WHOLESALE POULTRY-WHOLE SPORTING GOODS-SEAFOOD RECIPES-DEER RECIPES-ELK RECIPES-FISH RECIPES-WHOLESALE ALLIGATOR-WILD GAME RECIPES-DUCK RECIPES.WILD GAME SPICE.